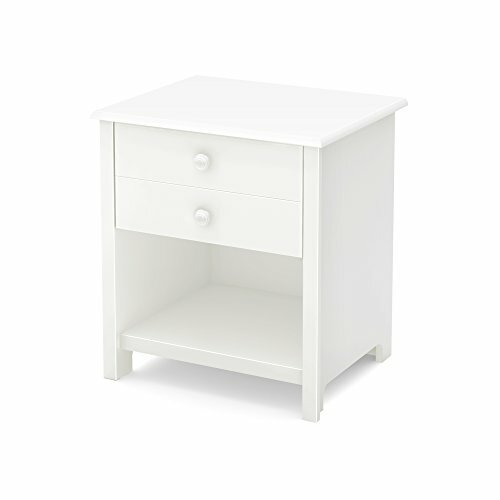 This cute nightstand will add a heartwarming touch to your kid’s room. It chases away the monsters under the bed, and also gives you some handy storage options that are easy to access. The unisex design means you can keep it in the family for years to come. Wooden knobs. Decorative groove on top drawer, recessed sides for a transitional style. Metal drawer slides for a smooth glide. Open storage space has a hole for passing cords through. Combine it with the bed from the Little Smileys collection (10203).. Drawer dimensions #1: 22.5'' (L) x 13.75'' (D) x 4.25'' (H). Shelf #1 dimensions: 17.5'' (L) x 15'' (D). Accessories not included. Requires complete assembly by 2 adults (tools not included). 21.1'' (L) x 17'' (D) x 23.25'' (H). Box dimensions: 28.2'' (L) x 17.75'' (W) x 4.5'' (H), 32 lb. Packaging tested and certified to reduce the risk of damage during shipment. Made in Canada with non-toxic laminated particleboard. 5-year quality guarantee. Any questions? Contact the manufacturer, available 7/7 by phone, email or chat.